The No. 15/16 Towson University football team will close out the regular season with a battle for the ages on Military Appreciation Day, hosting No. 7/8 James Madison at Johnny Unitas® Stadium on Saturday, Nov. 17 at 2 p.m. This Saturday at 2 p.m., the Towson University football team will play its most significant regular season finale since 2011. In that game, the Tigers played at Rhode Island with the CAA title on the line. The Tigers beat the Rams and made the FCS playoffs for the first time in school history. Tom Flacco has been named to the College Football Performance Awards (CFPA) Midseason FCS National Performer of the Year Trophy Watch List, announced by the organization on Thursday. Flacco is also on the Walter Payton Award Watch List for FCS Player of the Year. Currently, the redshirt junior quarterback stands third in all of FCS with 340.4 yards of total offense per game, including being 12th in FCS with 275.2 passing yards per game. 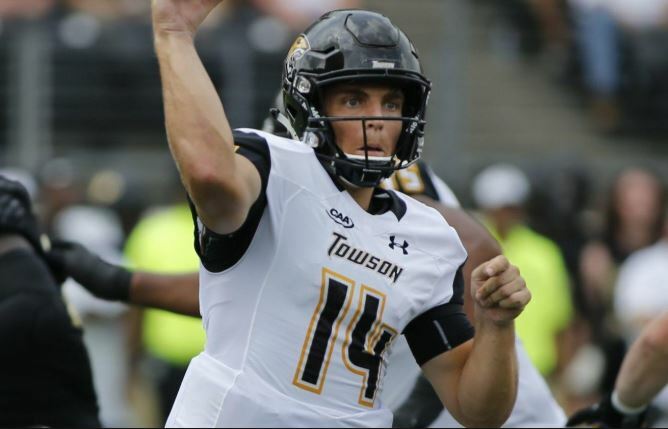 His 25 passing touchdowns, second-most in Towson single season history, is fourth in FCS.